So, you want to improve at Futsal? You’ve come to the right place. 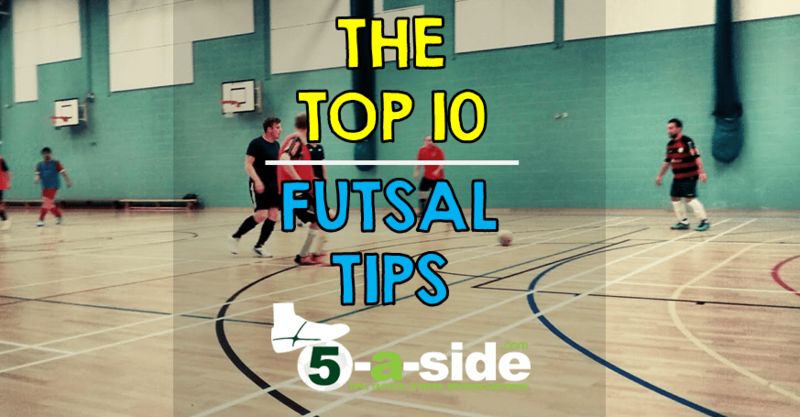 This list of futsal tips will make you a better player at a game which, quite honestly, doesn’t come naturally to a lot of players at first; especially if your background is in 11-a-side football. Futsal is the only format of 5-a-side football that FIFA have sanctioned for international competition and, if you haven’t experienced it already, you will find that it is a totally different beast from full 11-a-side football. Whilst it requires much of the same skill-set as the full game, you need to know some specific tips, tactics and strategies to really be good at it. So, here’s your essential list of futsal tips that you need to know to play the game. These aren’t just tips from a stuffy coaching manual or things you pick up from a coaching course; these are the things that players of the game find useful. And we can guarantee that’s the case because this list has been put together in consultation with a load of futsal players playing in our local league. Here’s the top tips that work for them, and the things they wish they had known ages ago. Futsal is an incredibly fast-paced game and after a couple of bursts up and down the court you’ll find yourself hanging on for dear life if your fitness isn’t up to scratch. Unfortunately there’s no time to stand and rest – the play will continue to move on, with or without you. Even when the ball goes out of play, the rule is that it needs to come back into play within 4 seconds: bad news if you’re unfit. Apart from the obvious idea of getting fit (that’s for a separate article: ‘how fit do I need to be for futsal‘) the solution to tiredness is to make sure you’ve got subs and you’re rotating them. The futsal rules cater brilliantly for this – you can make subs whenever you want, without having to tell the referee, as long as the sub comes on through the designated areas of the sideline. In the local league, the teams that turn up with just 5 players and no subs rarely win their games, but always end up looking like sweaty heart-attack candidates when the final whistle blows. Get at least one sub, preferably two, so that you can take it in turns getting a breather and the rest of the players can keep the pressure on the other team for the full match. Extra tip: try to avoid disrupting the play with your substitutions. Far too many times a sub runs on enthusiastically and then 10 seconds later frantically asks his teammates “where am I playing?”. In the time it takes to figure it out, the team shape has gone and the opposition have scored. This is very easily avoided by making sure your subs know what they’re doing when they come on. Having a good goalkeeper is absolutely essential to being a good team. Make sure yours knows what they’re doing. The futsal goalkeeper rules seem to catch all the newbies out. They’re not that complicated, but they’re different enough from normal football rules that they confuse a lot of people. There are no goal kicks. When the ball goes behind, the keeper restarts play by rolling or throwing the ball out with his hands. The throw must be to a player standing outside the goalkeeper’s area. When the keeper has played the ball out it can’t be played back to him unless it has either touched an opposition player or the goalkeeper is receiving the ball in the opposition half (yes – the opposition half – it happens more than you might think). The rest of the team therefore need to be careful about when they pass to the keeper, but you’re always safe to pass to him from a kick-in, and a lot of teams find it useful to do this. The keeper can come out of the area (and all players are allowed in his area) and become a 5th outfield player at times. When he’s got the ball at his feet he’s still only got 4 seconds to play it, but it makes him a useful extra player to have. It’s not unheard of for goalkeepers to end up scoring goals, especially if they’ve got a good long-range shot on them. A keeper who plays as an outfield player is known as a ‘fly keeper’. You’ve got to have a basic structure to your team. Whether you’re playing a diamond, a square, or one of many other futsal formations, make sure your team understand it. It’s not rigid; people get pulled out of position and rotate at times, but without some basic organisation you’ll be a disorganised mess with either nobody attacking or nobody defending. When we first started our futsal team, we used 4 different systems in our first 10 games. That taught us two things: firstly, it’s important find a style that suits the players, and secondly, it’s very important to settle on a system and stick with it long enough that people get used to it. 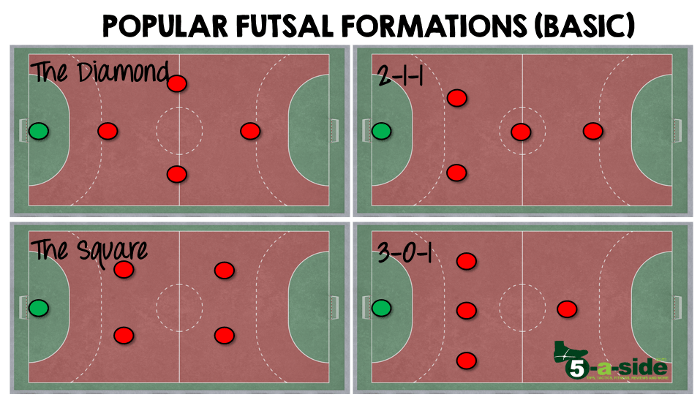 Below are the most popular formations, but if you want to understand the pros and cons of each, check out our guide to futsal formations for more detail. Futsal is like basketball: you attack and defend as a team. Having players who won’t track back to do any defensive work is a recipe for losing games. You will learn this very quickly; usually the hard way! Defending is a collective task, and requires great communication to do it properly. To avoid defensive calamity on the pitch, you should try to agree on your approach to two main issues. The good news is that there’s not a right or wrong decision in either. Are you defending man-for-man or zonal? Forget the very finer points of this age-old debate, at an amateur level it doesn’t make a huge difference which you use as long as everyone knows what their job is. We’ve conceded lots of goals where one person has played man-for-man and the other has stayed zonal, leaving space for the opponent to exploit. In our team, we’ve decided we’re all going man-for-man as we find it a simpler system to play, but the zonal system might work for your instead. Are you doing a half or full-court press? The full court press is where you push on and challenge the opposition wherever they are on the pitch. The half-court press is where you sit back and do your defensive work mostly in your own half. Both have their advantages and disadvantages but the most important thing is that you do it consistently as a team. There’s not much point one of your players chasing the opposition around in their half if they’ve got no support from their teammates. Getting enough grip on your shoes is vital, even if it’s sometimes difficult. Chances are that the court you’re playing on isn’t a squeaky-clean international-standard surface. It’s probably covered in dust and dirt which can make gripping really difficult. In our local league a lot of players who are used to playing other forms of football found this the hardest part of adjusting to Futsal – they just can’t get the traction they’re used to from grass or artificial turf. But there are things you can do to help. For a start, get some decent futsal shoes that are made for indoor surfaces. Also, make sure they’re clean – if they’re covered in dirt and dust when you start then you’re part of the problem. The soles of the shoes have to be very clean in order to get the maximum level of grip on the floor. You should be washing the soles of your shoes each time you play – here’s our guide on how to clean your shoes for maximum grip and traction, with a few extra tips thrown in. It’s a tiring game out there, and there’s a temptation to try and sneak a little breather in here and there. You’ve played a pass to a teammate, time for a little rest now, right? Wrong! The only time for a rest is when you’ve been substituted off. Watch any of the professional futsal teams play the game and you’ll see it’s all one and two touch stuff, a pass-move-pass-move whirlwind of activity. Rarely do the pros take more than three touches on the ball before they find a teammate who has run into some space. They make the pass, and then they’re on the move. You have to be like that too, otherwise the opponents will find it all too easy to mark you out of the game. If you’re not passing and moving each time, you’ll probably want to make way for a sub who can. The space on the futsal court is tighter than your average Kim Kardashian dress. So if you’re expecting to be able to play an expansive running-with-the-ball game you’ll be sadly disappointed. Instead futsal is about close-control, and what that means a lot of the time is using the sole of your foot to manipulate the ball in tight situations. When the ball is in contact with the sole of your foot it’s well under control, and you can quickly move with it in almost any direction, wriggling away from any potential danger. The same tip applies for any form of 5-a-side where you’re operating in tight spaces. You don’t have the luxury of always using your instep to tap the ball a few yards in front of you all the time. So, if you want to be taken seriously as a futsal player, learn how to use the sole of your foot. Football purists might want to look away, but in Futsal the toe-punt is actually a great technique. Particularly when you’re shooting at goal. The disadvantage of the toe punt is that it lacks accuracy, but what it lacks in precision it makes up for in other areas. What makes so potent is the sheer craftiness of it; you can get a shot off incredibly quickly with very little back-lift, yet it still packs plenty of power. And because it comes so quickly and there’s such unpredictability to it, the goalkeepers find it a nightmare to deal with. Honestly, try it. Everyone in Futsal from the better amateur players, right up to full international pro’s use the toe poke and that’s simply because it works. A lot of times you’ll have a player with the ball looking for some options of what to do with it. Suddenly, thinking they’re helping him, the rest of the team move towards him to offer for the pass. Whist the intention is well-meaning, this will soon end in having all 4 outfield players within about 5 meters of each other. That’s not a good situation because there’s no width or depth to the play. When all 4 of you are boxed into a narrow area of the pitch, it’s a gift for the opposition who can press right up and make it extremely difficult to work out of it. Even any potential space to dribble into has been crowded out for the player on the ball. Instead, when you don’t have the ball, keep making those runs that open up space, not close it down. It’s very hard trying to get your tactics and playing system to work when you’re using more players than the average NFL team. Although it might be difficult to get the same starting five playing each week, especially where people have other commitments, continually relying on one-off appearances from stand-ins isn’t a great strategy. They won’t understand your system, they’ll still be trying to get used to the Futsal format, and then someone else will come along next week in their place, repeating the process. Try to get a settled squad of players who are able to play nearly every week. Futsal has a very sensible rule where, if you commit 5 fouls in any half (the count resets at half time), the next foul is awarded as a penalty kick (but from a bit further back than a normal penalty). It’s what theoretically stops teams just deciding to hack for an entire game. But those fouls build up quickly even if you’re not playing dirty. All it takes is a few silly fouls and you’re fast approaching the dreaded 5-count. Even if you end up avoiding committing another and giving away the free-kick, it’s a stressful place to be and is unsettling for players. When faced with the stress of the situation, some players seem to completely lose their minds and switch off from doing the basic things. You’ll see a lot of teams fall apart at this stage through a disastrous combination of frustration, nervousness, and ill-discipline. It’s best not to get to this stage at all. So, that’s our list – have we missed any tips that are on your list? Share them below and we’ll add the best ones in to this guide. If you enjoyed this list, aimed at getting beginners competing with the rest, head over to our more advanced list of 25 top Futsal strategies you must know. Great tips and great explanations! one tip I would add, is to not be afraid to defend for a long period of time. Teams tend to really like possession, but if you can keep your calm and defend well, it can frustrate them and leave them impatient. Be prepared for the counter attack and get some goals! That’s not been our experience. Do you really think they’re easy to save? We have a fairly decent 6-a-side setup here in Mumbai (India) specially designed for corporates and the football lovers who cant let go off the beautiful game they played on big expansive grounds in their youth. It’s a great way to keep the connect with the game, at a time of your life when familial and work pressure bear down heavy on you. We used a slight modification of the 2-1-1 system (making it 2-2-1) and worked a lot on the sole-control of the ball to great effect. Thanks for all the other tips. It really helped us build on our fitness. Thanks for the comment. I’m really glad that you’re finding the site useful. Whatever format of small-sided football you’re playing, this site is designed to help! If you don’t mind, I would like to show you my blog for any attacking players who want to improve themselves. I also have a blog about how to defend in futsal but i will post that on here soon. Nice one Samy. Thank for the link – a good read. Hi there, check out our futsal formations guide for ideas and explanation. I would go with a simple diamond or square formation, depending on which you feel suits your players more. Thanks for the tips. I’m coaching a U-10 boys team and your illustrations are great for sharing with them. You’re very welcome. I hope you have fun coaching them – that’s a great age for learning the game. Great tips in simple language from an amateur perspective. This is what is needed, not always seeing things from the pro’s side which will be practically impossible to put in place. Will try to contribute with my own tips. Hey Francis, thanks a lot for the comment. Glad you found it useful. That was exactly what I was aiming for when I wrote it. 10 basic tips to help anyone improve. Next step after this is the article with 25 must-know strategies. I’d love to hear your tips. Get in touch if you have some good ones, maybe they deserve their own article. Nice guide. I’m hoping to play a bit of Futsal soon and I’ll definitely be referring to this. Cheers. Hope you find it useful Adam. For me, learning how to use the keeper effectively has been key. I’d be interested to know which you find the biggest challenge when you play.